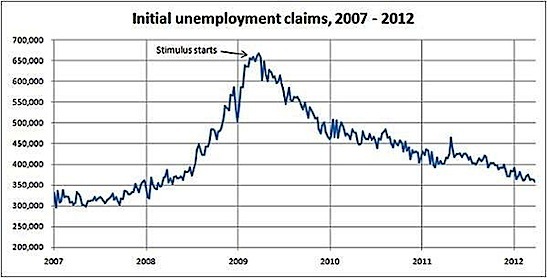 As does the chart of private sector job growth in Stimulus Redux the following chart of initial unemployment claims from The Maddow Blog demonstrates that the employment situation began improving immediately with the implementation of the American Reinvestment and Recovery Act of 2009, better know as the stimulus. The stimulus produced more jobs in 2010 (1.1 million) than in the entire 8 years of the Bush administration (1.0 million), though you won't hear partisan Republicans applauding its success. Indeed initial unemployment claims are approaching levels last seen before the Great Recession. Employment figures have continued to improve though at a more modest rate with the exhaustion of the stimulus funds. It's pretty clear to Panderbear that the only thing holding back a full employment recovery is the inadequate size of the initial stimulus, the lack of a second stimulus package, and the dramatic public sector job losses particularly of teachers and police in the states where legislatures and governorships were taken over by Republicans in the 2010 midterm elections. A larger stimulus could have avoided these draconian cuts to essential public services, but of course was impossible with a radically intransigent Republican House of Representatives and unbreakable filibusters in the Senate. Panderbear thinks balancing the federal budget in the long run is a laudable goal, but basic economics has long shown that austerity measures during a recession, especially one of the magnitude of the Great Recession, are precisely the wrong prescription. Lack of private sector investment must be balanced by increased public sector investment in essential services like schools and police and infrastructure. Yes, this means temporary deficit spending, but that's what it takes to avoid a downward spiral in unemployment produced by austerity measures requiring reducing the debt before addressing unemployment. Europe is currently learning this lesson the hard way with the failures in Greece, Spain, Ireland, and other countries where austerity has been given higher priority than employment. We should heed the lessons of their failures. Stimulus leading to recovery of employment must precede measures designed to balance the budget.